A businesswoman, (let’s call her Janice), who after having gone through a difficult personal crisis, made the well-intentioned decision to shift her life-priorities. Janice resolved to reduce her workload so that she could fit in the meaningful yet overlooked and unattended aspects of her life. Janice enjoyed the challenges of her career and took on her responsibilities with great dedication. However because of this over commitment to her work, Janice had little room for anything or anyone else. But the recent chaos in her life jolted her into a new awareness around life harmony and completeness. Sound familiar? How often have you had a similar awakening as Janice did? Can you say “I feel complete in my life?” or instead is life saying to you “Hey, pay attention!” But often these seemingly pivotal moments create little more than vehement declarations followed by inaction. Much like a fully blown balloon fizzling to the ground as it loses air. In Janice’s case she did take one more step by pledging to rejig her work modus operandi and let-go of her perfectionism and need to “do-it-all”. Yet without having a clear definition around what that would look like, she was left with the same old M.O. … micromanaging everything and being the go-to-person on her work team. Janice had two critical concepts to consider if she was going to enjoy a new way of functioning. What was her present situation? What was and wasn’t working? Was she clear about her priorities around her work responsibilities? Was she setting good boundaries? What were her needs, values and wants? All different questions but related. How did she ask for them? What was her ideal vision of the new and better way of operating? The answers to these questions would necessitate stepping back for some reflection and contemplation time. The second critical concept Janice would need to consider was her ability to embrace Change. There is a lot written about and feared around change. People put up with or tolerate a lot of discord in their lives just so they don’t have to experience change. Change can cause pain and stress because it often asks us to confront the unknown. 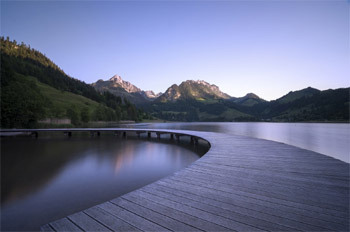 The uncertainty of a meandering boardwalk can cause stress. But staying stuck in the same pattern can also cause stress. However it is this very stress, which can often become the tipping point for change to happen. Janice catapulted into wanting change when she realized her present situation was no longer acceptable .. when the pain of staying where she was became greater than the pain of moving to the new … the unknown. Change takes courage, initiative, and sometimes a massive leap of trust into the unknown. 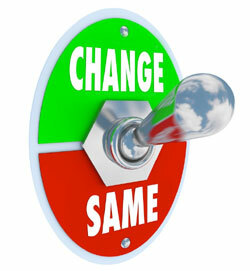 What will it take for you to flick the switch from “same” to “change“? The concepts of Noticing and Change are interdependent, the latter difficult to achieve without the former. It would be near impossible for Janice to change that which she had not yet identified. To initiate change in her old patterns of operations she would need to clarify what needed changing. This may seem obvious but sadly few of us can clearly articulate what creates dysfunction in our lives let alone what works, or for that matter, what we’d like our “new now” to look like. To experience harmony, resonance and flow in your personal and professional life explore and learn about that which you most need, value and want. Examine your present beliefs, perceptions and behaviours to clearly identify where change needs to happen. Only then will you be able to move forward with a positive plan of action to create the change that will improve your life. Have an enlightened day and remember to share your stories below about your own experiences around Noticing and Change. Wow, Viv! You nailed the idea behind the steps to noticing. You have helped me to notice that when I feel a need to make changes in my life, its helpful to examine the stories in my head that support my fears and imbalance. I know I am getting back into in a balanced state when I feel compassion for myself and those around me; that’s when I am better able to notice opportunities for change and they occur more easily without a struggle.